Flat Stanley arrived at our house and he spent some time here learning all sorts of fun things to do. Instead of taking him around Eugene (we had a lot of yucky rainy weather), we decided to show him what we do with our spare time. If you would like to check out what Anthony did with Flat Stanley (vroom vroom!) check out his site, Ride Three. 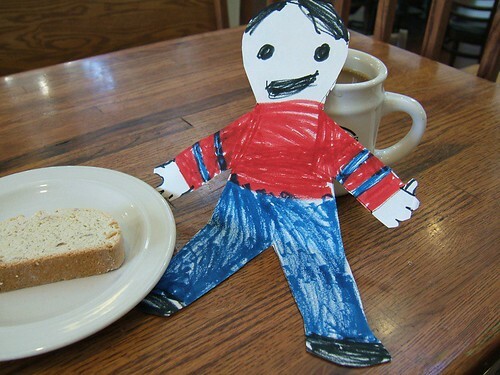 First I took Flat Stanley out to coffee. You just can’t visit the Pacific Northwest without getting coffee. Flat Stanley didn’t like the coffee that much, so I drank up the coffee while Stanley got to work. We went to the coffee shop to learn how to knit. I showed him the cuff of the sock I was working on. Learning to knit and purl. 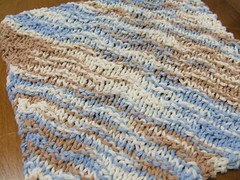 Then he started working on his first project, the Ripple Dishcloth. 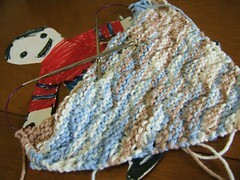 He had gotten quite a bit done on the dishcloth when he went into my knitting bag and we had to go home. 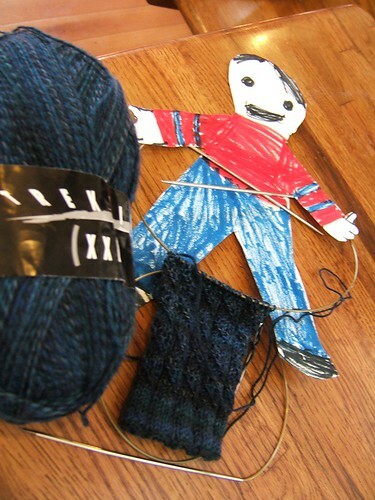 After our trip to the coffee shop, I had to go to work, but now Flat Stanley had something to do with his spare time. So when I got home I took him out of the knitting bag and he had finished the dishcloth! He gave it to me as a gift for showing him how to knit! He must have know that knit dishcloths are one my favorite things! I have to stay that Flat Stanley was an excellent guest. He was very kind, considerate, and we had a great time! 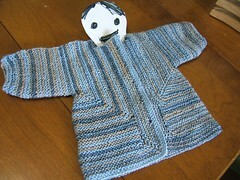 Flat Stanley wrapped up in a Baby Surprise Jacket. Thanks Flat Stanley! Hope you enjoyed Eugene, Oregon! You are very clever! I blog boring stuff at http://www.xanga.com/terrific58 but it has tons of photos because I love to shoot pictures.